There are a number of things that a person can do to protect their recovery from relapse. Some efforts are apparent, while other methods may not occur to some people when considering relapse prevention tools. Those who have been in the program for a time know that their recovery is contingent upon working a program of spiritual maintenance; included with that is attending meetings, working the steps with a sponsor or mentor, and being of service whenever and wherever possible. Individuals who follow the protocol above have an excellent chance of staying on course. The program works if you work it, as the saying goes; but we would be remiss if we failed to share with you various to shore up your recovery. It’s vital to remember that even though addiction is a mental illness, physical well-being plays a significant role in matters of the mind. People who eat healthily usually feel better as a result, and when you feel better physically, it is easier to keep one’s mind from drifting astray. What’s more, taking some time throughout the week to exercise can do wonders for your mental health; again, those who take care of their body tend to feel better. Committing to taking better care of yourself isn’t a small undertaking, our best intentions don’t always lead to establishing healthy routines. You have to dedicate yourself to changing your relationship with food and exercise to experience noticeable benefits. Furthermore, one must go about changing their routine carefully, ensuring that you don't do anything to the extreme. Too much of anything is never good, taking a moderate approach to changing lifestyle attributes is critical. Eating healthy and exercising is especially beneficial for people in recovery. Years of active addiction takes a severe toll on the body. Over the course of a person’s using tenure poor dietary habits develop that are challenging to break. Making a point to get to the gym is typically not the priority of most addicts and alcoholics. However, just because an individual has a history of unhealthy behaviors doesn’t mean they can't have a health-oriented future. After all, people abstaining from drugs and alcohol have already made a tremendous effort towards living a healthy life. If you adopt a program of recovery, then it’s likely you can incorporate some healthy traditions into your day-to-day life. One of the echoes of the past that persists in many people's recovery is tobacco. Cigarettes are often the last thing people part ways with on the road to progress. Treatment centers always encourage clients to quit while in treatment, but not everyone manages to accomplish the task before discharge. If you are one of those people, please know that we understand how arduous smoking cessation is for most tobacco users. Although, just because you are still smoking doesn’t mean you can't accomplish the feat of quitting outside of treatment. A motivating factor for quitting that many people in recovery are unaware of is the risk of relapse that researchers associate with smoking. Yes, people who smoke are significantly more likely to return to their drug of choice (DOC), compared to others who work the program with the same dedication but don’t smoke. If lasting recovery is your goal, then considering axing tobacco from your life is essential. The good news is that you already have tools at your disposal to help you quit, your program of recovery. Remember, everything you did to free yourself from alcohol or any mind-altering substance can also work with cigarettes. 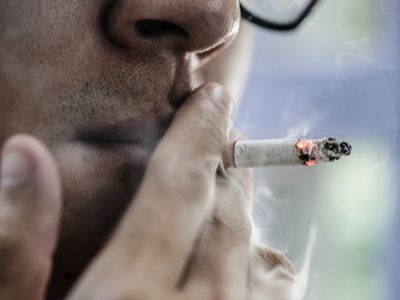 People with interest in quitting can turn to their doctor for help, too. Medications in tandem with cognitive behavioral therapy (CBT) techniques have shown a lot of promise in recent years. Even without drugs like Chantix, patches and gums can be helpful, too. Please note that smoking cessation products are, more time than not, most effective when utilized in conjunction with therapy or working a program like the 12 Steps. Today, many people have begun relying on e-cigarettes to quit, given that vapers can lower their nicotine dose over time until they are finally free. Scientists are still debating the efficacy of nicotine devices, but reports show that e-cigs have helped many people. Interestingly, the FDA has presented a new tobacco regulation plan calling for lowering the amount of nicotine per gram of tobacco to 0.4 milligrams, The Los Angeles Times reports. Researchers say that the 97 percent decrease in nicotine content could help millions of Americans finally quit. We will see what happens with the FDA’s proposal, but wouldn’t it be ironic if less harmful cigarettes are what leads people to stop? Fighting fire with fire, in a sense! If you or a loved one is struggling with alcohol or substance use disorder, please contact Whiteside Manor. Our experienced staff can help you adopt a new way of living and give you tools for working a program of long-term recovery.